“”Guilty of certain accusations” is the latest from a papal bulletin issued on March 16 on Guam’s suspended archbishop Anthony Apuron. Apuron, to date, stands five times accused of clergy sexual abuse. While the Tribunal has reached their verdict, he still faces civil lawsuits in the District Court of Guam. 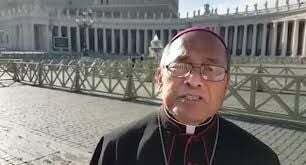 According to the Congregation for the Doctrine of the Faith, this means he’ll be removed from office and prohibited from residence in the Archdiocese of Agana. Even if Apuron appeals his sentence, local Catholics are urged to push forward with penance and reparation. A news conference will be held on Monday where Archbishop Byrnes is anticipated to make further comment on what this means for the Archdiocese of Agana. Until then, he extends his prayers and thanks the victims and their families for having the courage to share their agonizing stories of abuse by Apuron. Quintanilla was the first of five to accuse Apuron – followed by Walter Denton, Roland Sondia, and Doris Concepcion on behalf of her late son Joseph “Sonny” Quinata. Mark Apuron, in recent months, also came forward alleging he was raped by his uncle. According to the Holy See Press Bulletin, Apuron remains in limbo because of his pending appeal.